The London Bass Guitar Show is all about showcasing talent from the length and breadth of the bass guitar world and show-goers looking for something a little different should check out up-and-coming artist Dmitry Lisenko who has ditched the usual tech in favour of an acoustic bass and sharp, heartfelt delivery. Described as the "Andy McKee of the bass world", the Latvian-born, London-trained bassist currently plays with socially-outspoken acoustic duo KarmaFree, and is also in high demand as a bass educator, speaking worldwide at shows and gaining endorsements from brands such as Warwick and TC Electronics. We touched base with the refreshingly honest star ahead of the show to find out about his upcoming set, the joys of travelling light and why you shouldn’t bother getting onstage if you’ve got nothing interesting to say. "I’ll be playing songs from my upcoming album, which I plan to release this year. So it’ll be a good chance to hear the new tunes before the official release." Your music could be described as ‘stripped down’ and you’ve talked about how going acoustic can free you up to play, without being weighed down with gear. Are there any particular acoustic bass-makers you’re a fan of? "Yes, with acoustic instruments, you’re quite vulnerable, and your music is very fragile, as there are no places to hide. "Every slight mistake can ruin the performance. I’m a fan of Alien basses by Warwick - that was my choice when I was looking for my first acoustic bass, as for the same price frame Aliens were way better than any other acoustic basses I found. "There are a lot of great luthiers and small companies who make custom basses. Last year at LBGS I met Michael from Gillett Guitars, who makes incredible acoustic basses." You’re coming to be well-established as a bass educator online. What makes a good teacher in your opinion? What’s the most important thing you hope to teach your students? "A good teacher is a person who doesn’t teach but rather guides and makes corrections: the aim of the teacher is to find something unique in a student and help them to bring their individuality up. "I am always afraid to influence students too much - there doesn’t need to be a second Dmitry out there. When people try to be like you they can risk losing their own identity. The most important thing I want to show is that music is an art, and art has no boundaries - no one needs to be afraid to experiment. "A lot of people laughed at me when I was starting out, and told me that I was playing wrong, but no one is laughing now! Everyone can find their own voice and unique way of self expression. That’s the beautiful thing in art." A lot of people laughed at me when I was starting out, and told me that I was playing wrong. Are there any other artists on the line-up at LBGS that you’d be excited to go and see? "Definitely Cody Wright - he’s No. 1 on my list - and it’ll be interesting to see Ida Nielsen." "Usually I am looking forward for some freebies! And I’m still experimenting with a strings, I haven’t found a right set yet, so it will be good to try something new at the show." LBGS is known for its ‘wall’ of bass noises, with a friendly sense of competition often on display around the stalls. Do you have a ‘party-trick bass-line’ that you launch into when you enter a music store in order to wow other shoppers? "Oh, it’s easy, I just grab an acoustic bass and start to bang on it!" Who inspired you to become a bassist? If you could only listen to one bass-line from a song for a whole year what would it be? People get used to seeing music as an entertainment - in KarmaFree we see music as an art. You have incorporated messages about animal rights and anti-consumerism into your lyrics with KarmaFree. What do you think makes for a good protest song? Is that an important part of your music, or are you more focused on the technical side of things? "The message is the most important part in our music. I came a long way to realise that, as a bass player I’ve never listened to what vocalists are singing about; but then after years in music I started to understand that music can be a great way, not only for expressing emotions, but also to actually tell something. "Now I think there is no point of being on stage if you don’t have anything to say. For me now, it’s not the bass parts, not the technical parts, not the sound, but the message that’s the most important thing in music. It’s quite unusual for a bass player you know. "With protest songs you have to believe in what you are saying, and there must be a deep meaning and the right way of expressing it. People get used to seeing music as an entertainment - in KarmaFree we see music as an art. During gigs we try to get people to think about messages, although most people want to relax and not think about anything during gigs at all. 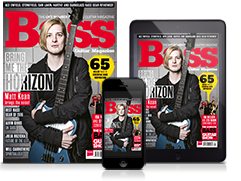 What would you say to a bassist who’s struggling with band tensions/lack of motivation? "I think at first you need to stop comparing yourself with the others, and understand that everyone is unique and has their own way and place in time. "Secondly you don’t need to be technically or musically advanced to be a successful musician, as music is not a sport or competition - it’s a self expression, and to express yourself you don’t need to be better than anyone, you just need to be you." 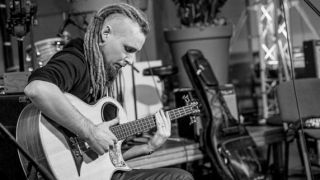 Dmitry Lisenko will be performing and speaking at the London Bass Guitar Show 2017 on March 4 and 5. For information, visit www.londonbassguitarshow.com, www.facebook.com/londonbassguitarshow or @bassguitarshow.